Camp Coral Kids, a unique camp for children with diabetes, received a generous donation from The Michelle McGann Fund, as well as a visit from professional golfer, Michelle McGann, who was diagnosed with Type 1 diabetes at the age of 13. McGann presented Broward Health’s Camp Coral Kids with a check for $7,500 which will provide 20 scholarships to attend the camp where children with diabetes ages 5 1/2 – 11 can connect with others who understand what they are going through in a fun, educational and medically supervised environment. For more than 20 years, Broward Health Coral Springs has been the home to South Florida’s only day camp for children with diabetes. Camp Coral Kids offers a fun environment where kids can meet other children with diabetes while enjoying a full range of camp activities and day trips. During the two-week camp, kids also learn about how to manage diabetes under the direction of medical professionals, with topics including insulin management, glucose monitoring, and nutritional guidance. McGann shared her that even though she has Type I diabetes, she was able to become the successful golfer she is while managing her insulin treatment. 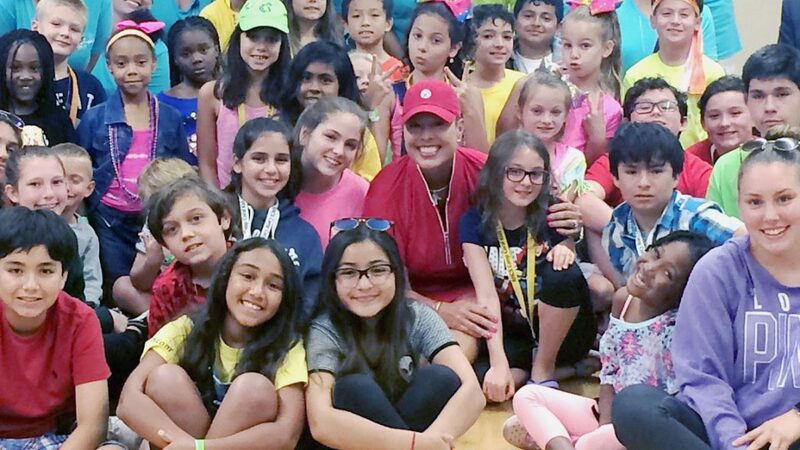 In turn, campers shared their stories with her, as well as their fun experiences at camp. “There are so many other athletes now with diabetes that had very successful careers and are continuing to play their sport, so I think with all of that, we can all be an inspiration to them,” said McGann. Diabetes can be overwhelming for children trying to navigate the symptoms, treatment and management associated with the chronic condition. Complications resulting from poor diabetes management and lack of awareness and support include hypoglycemia, heart attacks, strokes, blindness and vision problems, kidney disease and more. In 2013, the cost of diabetes reached nearly $250 billion. Michelle McGann will be playing at the LPGA Legend Tour July 10-12 on the Golf Channel.